Foothills. Disturbed sites. Spring, summer. Near Yellow Jacket Canyon, June 14, 2011. 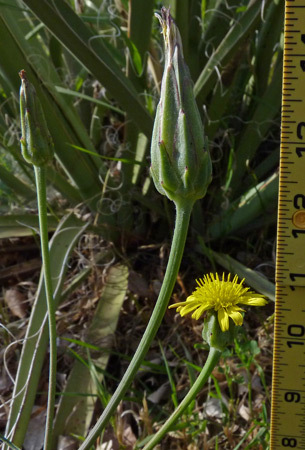 Scorzonera laciniata grows to several feet tall; has only ray flowers that open about when the sun hits them and close in a few hours; phyllaries are finely hairy, strongly keeled, and in 4 rows; stems are glabrous to sparsely hairy; basal leaves are up to 15 centimeters long and deeply cut; stem leaves are reduced in size, usually entire, about a centimeter wide in the middle and tapering at both ends; fruits are usually 10 ribbed; and the pappus hairs are bristles with a multitude of cobwebby hairs. 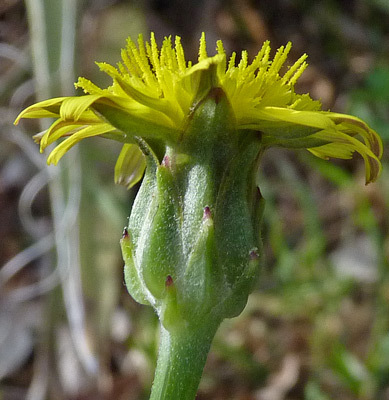 Scorzonera laciniata is a recently introduced (1994 in New Mexico and 2008? 2009? 2010? in southwest Colorado) alien species that is spreading through the Rocky Mountain states. The plant was named by Linnaeus in 1753. As the Flora of North America points out, the genus name is "perhaps [from the] French "scorzonère", "viper’s grass;" [but the] allusion [is] unknown". 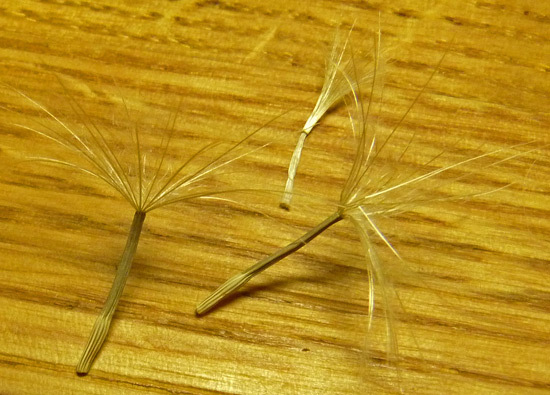 "Laciniata" is a common specific epithet from the Greek for "torn or cut into pieces" and can refer to leaves (as in this case), petals, or other plant parts. Near Yellow Jacket Canyon, June 14 and June 19, 2011. 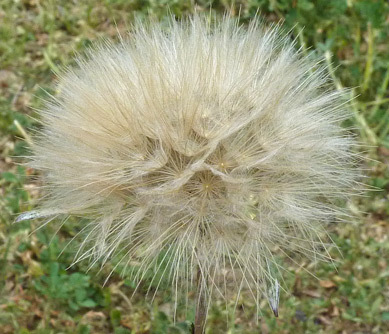 Flower heads are about an inch in diameter; seed heads are twice this. 2) You can use the most up-to-date keys and still fail to identify a plant. After being unable to identify the plant with the above books, I turned to the on-line version of the Flora of North America, but I still could not identify the plant. I am not sure where I went wrong. 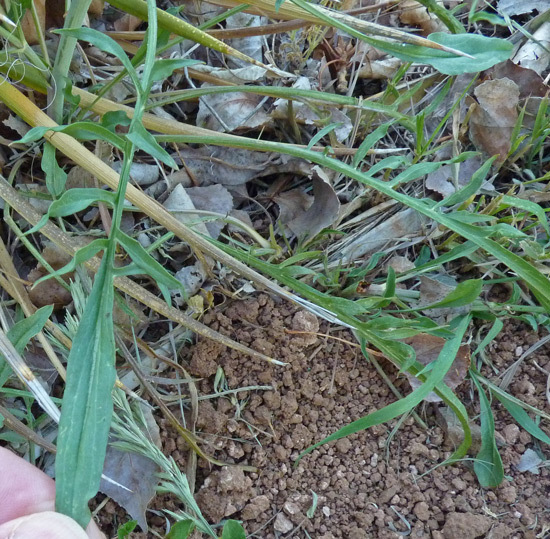 3) You can identify a plant if you ask for help. 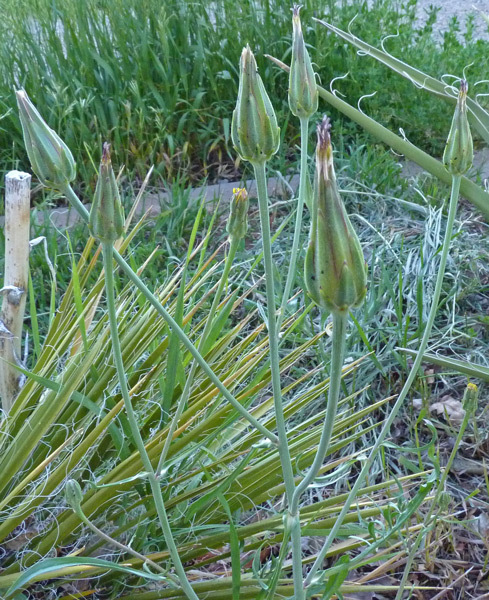 The correct identification came to me from several folks who identified the plant from my photographs on the Listserve of the Native Plant Society of New Mexico. 4) Once you learn the ID of your plant, look at the keys again to find out where you went wrong. After I was given the correct name for this plant, I went back to the FNA, found the plant in the key, and worked backwards to see where I had gone wrong. The answer was in the fluffy appendages (the pappus) that you see at left; these are usually called "hairs" or "bristles" but FNA calls them "scales" for this plant. Several times the key asked whether my mystery plant had bristles or scales. I chose "bristles" each time. That is where I went wrong in the FNA key. 5) Whenever one fails in keying a plant, one should go back over every step in the keying process and try other choices. When my choice of "bristles" did not lead me to a proper identification of my unknown plant, I should have tried the other choice, "scales". 6) Check definitions in the key you are using. The FNA has definitions of bristles, awns, and scales that are agreed upon by other keys. Most keys, however, do not bother to give the numerical accuracy that you will find below. Most keys say something like: "A scale is a flattened, wide trichome". The FNA definition of pappus bristles, awns, and scales is based on imagining a cross section of the pappus. Cross sections of bristles and awns are somewhat circular or polygonal and the longer measurement of the cross section will be no more than 3 times the shorter. Cross sections of scales are flatter, i.e., the longer measurement will be more than 3 times the shorter diameter.